Have you been hurt on the job? Did you know that work related injuries are covered 100% by workers compensation? Did you know that you have the right to choose your health provider using your workers compensation? If you are injured on the job, give us a call for a FREE INJURY EVALUATION 801-569-1141. We will answerer your questions and give you the absolute best care. 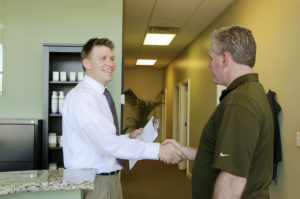 Dr. Collard will first get you out of pain and get you back to work. Then begin a treatment schedule to correct the injury preventing future health problems.